Barrister Ifeanyi Ejiofor counsel to Nnamdi Kanu granted an interview to Biafra Writers and Biafra Television Correspondents in Abuja after the court proceedings on the 9th of March, 2016. This is how it happened. Biafra Writers: Good day Sir. We are pressmen from Biafra Writers and we are glad to have you. And we can see you are brightened up. It seems there is a positive out come today? 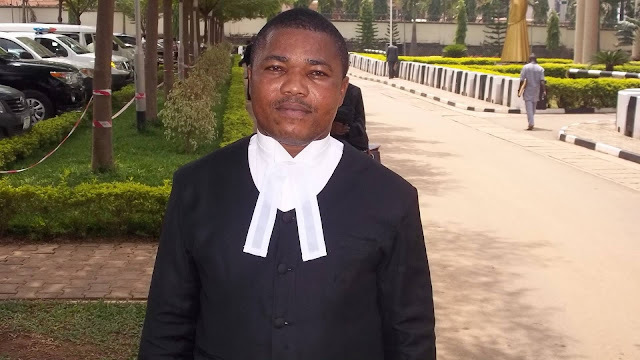 Biafra Writers: Okay the last court sitting, I think on the 7th of March. The decision of the Court was really Or rather it aroused several discussions both here in Nigeria and abroad, So what do you think is the position of the judge in respect of his previous decision? So we are taken aback when this man came out on the 7th of March and they orally applied to the court to vary the order the court made in the 19th of February. Biafra Writers: Okay...the judge made reference to an event in Ivory coast, can you throw more light on that? Biafra Writers: So what is the Court's decision today? Ejiofor: Ohh, in this type of case, you have to be on the ground and work assiduously day and night to make sure you give your client the best of your services. Biafra Writers: So was the defendants in court today? Biafra Writers: How did he feel? Biafra Writers: We equally heard in the last court on the 7th, issues about threat to your life. Biafra Writers: So what is your reactions to the actions of the the court toward the threat to your life? Biafra Writers: There are million of Biafrans all over the world....most are really optimistic that you can give us positive results at the end of the entire scenario. So what do you have for them?? Biafra Writers: Okay Sir, we are glad to be with you and we look forward to equally have more audience with you. Ejiofor: We need your prayers and encouragement. In this type of struggle we have only to believe in God, Chukwuokike-abhiama because we believe in the truth and I believe God is with us. Barr. Ifeanyi Ejiofor is a man of God, very intelligent and a legal bulldozer. With Chukwu Okike on his side, he will deliver. Family Writers more grease on your elbows. You are all Odogwus - Warriors. Keep on keeping up. Well done.